Crew of T42 after taking up and being released by C21. 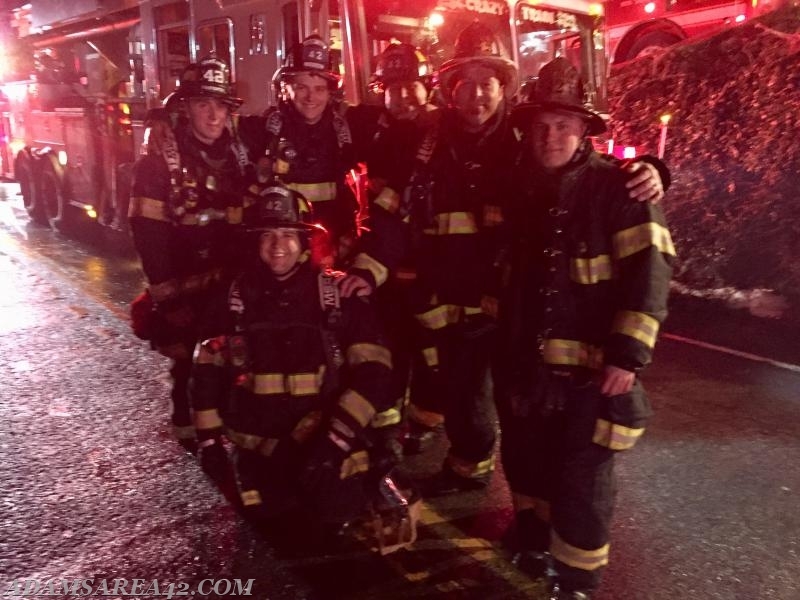 Crew was then assigned to cover calls in the SAFER Group area by moving up to Station 21-2. Tonight around 2140 hours Station 42 was dispatched to respond with the SAFER Group Station 90 into Cranberry's first due on Franklin Road for a reported structure fire. As the station was conducting a PA DOH EMR class, the Tower was staffed and out the door quickly along with the Chief. Also responding were RE 42-3, Squad 42, and E42 with a total of 16 personnel. The fire was found to be progressing rapidly and operations was quickly put into the defensive mode with exposure protection by Chief 21 as all occupants had evacuated the structure. Crews operated for a little over 5 hours.